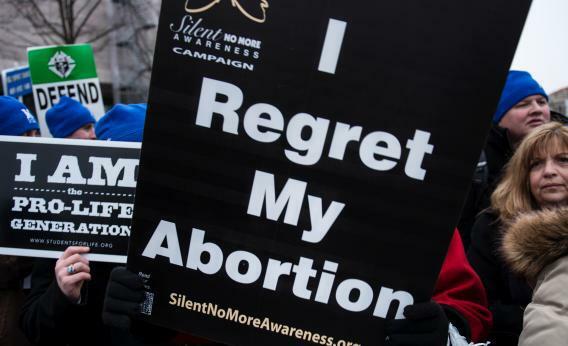 Abortion regret: It’s not just for pro-life women. Regretting a decision doesn’t mean you shouldn’t have had the choice to make it. Step into any pro-life rally, however, and stories like Lecroy’s mother’s aren’t just spoken aloud—they’re amplified over PA systems. Her mother recently repeated her story at the National Right to Life Convention in Dallas. Pro-life rallies are awash in pairs of tiny baby shoes, strung together to represent the women—or the pro-life organizers—who feel they made the wrong choice. The Silent No More campaign even makes rally signs for that. Women who regret their abortions are encouraged to tell their stories in these spaces. But their anecdotes don’t equal statistics, and a political rally is not always the best place to heal their distress. Lecroy’s mother’s story is not representative of how most women experience abortion. A 1989 American Psychological Association panel found that for women who undergo the procedure, “the time of greatest distress is likely to be before the abortion. Severe negative reactions after abortions are rare and can best be understood in the framework of coping with normal life stress.” Some women experience sadness and guilt, but they’re more likely to feel relief and happiness. And a woman’s emotional state post-abortion is consistent with her well-being before the procedure occurs. The emotional fallout from an abortion also needs to be understood in the context of a woman’s range of options when an unwanted pregnancy hits. Adoption and parenthood can be huge stressors, and their effects on a woman’s emotional well-being can also persist for decades. Stories like Lecroy’s mother’s also fail to account for the experiences of women who face unwanted pregnancies without the benefit of the legal right to choose. That’s not to say that the experiences of women who feel pain and regret after choosing an abortion ought to be discounted. Women aren’t given enough opportunities to talk about that experience outside the pro-life movement, which is invested in promoting the idea that post-abortion psychological stress is an unavoidable consequence of the procedure. And since the pro-choice movement is invested in highlighting the opposite (which is largely true), it means that we never hear the stories of women who regret their abortions but remain pro-choice. Those women exist. And women on both sides of the issue would benefit from greater access to mental healthcare and nonjudgmental public forums for working through their experiences. But no matter how a woman feels after she makes the decision, her personal experience never means that all women would be better off without the choice.